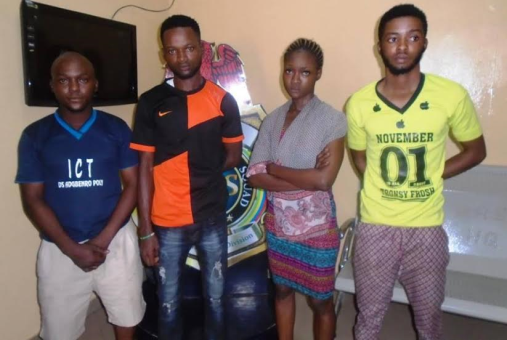 Operatives of Rapid Response Squad (RRS) of Lagos State Police Command on Friday apprehended a young lady, her boyfriend and two others for stealing an Automated Teller Machine (ATM) card which belonged to one Musa Alli and withdrew over N300, 000.00 from the account. The lady, Bamigboye Imoleayo, 24, was arrested by the operatives at a club house (name withheld) in Surulere area of Lagos State over the crime, before arresting three other accomplices, including her boyfriend, Adeyinka Ayodele, the same day in Itori, Ogun State. The victim, who reported the case at the RRS's office in Alausa, said that he met the suspect at a club in Surulere last week Friday. That the lady had earlier stolen his ATM before memorizing his Personal Identification Number (PIN) during online transfer of funds into his friend's account. "I thought I had misplaced the card not knowing that the lady had stolen it and thereafter glimpsed at the PIN for withdrawal", he noted. He said that he was shocked on Saturday afternoon when he received alerts amounting to N90, 000:00 withdrawals. "while I was still contemplating on how to deal with the issue, I got another debit alert for buying two Infinix phones totalling N84,000:00. I was confused and shocked. I didn’t know what action to take on a Saturday evening…. On Sunday, there was another debit. I couldn’t pin the crime to the lady I met at the club. I lodged a complaint on Monday morning at my bank and I was told that the withdrawals and shopping were legitimately made by me. I reported the incident at the RRS's office on Monday after informing my bank. My emphasis to the police was the withdrawals and shopping totalling N300,000:00. It was unbelievable for me when I was face to face with the suspect, the lady I met at the club. And, she explained everything," he stated. After the arrest, the lady, Bamigboye Imoleayo, owned up during interrogations that she pocketed the victims ATM card when the owner slept off during their conversation at night at the club. "I managed to steal the card when Musa (victim) dozed off during our conversations. Initially, I had spied on and crammed his PIN when he was sending money to his colleague via mobile app…. I committed this offence because I was so desperate to re-stock my shop at Wasimi in Ogun State, and also to take care of my only daughter. I never had a rethink while committing the crime. Although, I regretted my action now," she stated. She further narrated how she in company of her lover withdrew and expended funds from the ATM. "After I spied on his PIN during a particular banking transaction on his phone, I intended to only withdraw N20,000.00 out of his bank account and then destroy the card…. However, when I withdrew the money, and checked the account balance, I was shocked to see his balance. Afterwards, I withdrew another N70,000.00 again making N90,000.00 that day. Then, the following day, I called my boyfriend, who instructed me not to destroy the card, but i should come straight to Itori, Ogun State, where he resides. On getting to him, he called two of his friends, Abimbola Akintanna and Owolabi Bamidele, to use the ATM at any nearest bank." He added that they took the card to a shopping mall in Abeokuta where they bought phones and clothes. "The following day, we went straight to Abeokuta to use the card. We thought by going this far nobody could trace us. We bought two android phones for N84,000 at a phone store.… We proceeded to a boutique where four of us bought clothes worth N126,000. I recharged my phone with another N2,500 worth of recharge card. The money spent from the account was over N300, 000.00," she revealed. Two Android phones, 8 pairs of trousers and shirts were recovered from the suspects during a thorough search of their residents. Confirming the arrest, the image maker of Lagos State Police Command, Superintendent of Police, SP Dolapo Badmus, urged members of public to always protect their PIN during banking transaction at any point in time. The suspect and exhibits recovered have been transferred to State Criminal Investigation Department (SCID), Panti, for prosecution.